Distributed Proofreaders is proud to celebrate its 31,000th title, Colour in the Flower Garden — many thanks to all the volunteers who worked on it! Gertrude Jekyll, probably (after Capability Brown) the most famous English garden designer, lived from 1843 to 1932 and created at least 400 major gardens within Europe and North America, often working closely with the architect Sir Edwin Lutyens. She set out to develop a career as a painter, but developed an interest in the use of colour in planting, and, possibly prompted by deteriorating eyesight, moved into garden design. She was heavily influenced by Impressionism, eschewing excessive formality in design and planting. Her book Colour in the Flower Garden sums up the experience of 40 years, using the garden she designed for herself at Munstead Wood. The book describes her philosophy in detail and gives detailed planting schemes for many areas of the garden, but is by no means prescriptive. She describes what she has done and why, and lets the results speak for themselves. 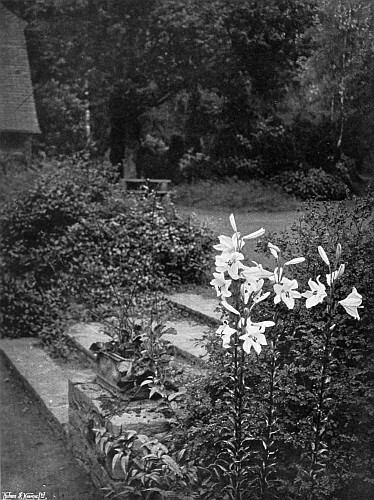 It is also profusely illustrated with, regrettably monochrome, photographs of the garden. For the gardener, it is a very accessible and interesting record, but from an age and of a scale which make it, perhaps, less than useful. Two quotations give a flavour of the scale and ambition.